We should be concerned with how fast and user-friendly our website is when viewed on mobile devices. In a study, it has been found out that people are five times more likely to leave a website that isn’t mobile-friendly. People don’t like to wait for too long hence leave slow loading site and look for alternatives. With the advent of technology, everything has gone mobile and so it is our turn. Websites that are not compatible and friendly enough loses track and lags behind other applications. People won’t stay if they can’t find what they are looking for or if it is taking very long for it to load. You need to keep your users engaged by providing a fast performing site. Google takes into account the loading speed as a ranking factor; therefore, it is imperative for you to have a faster loading website for mobile devices to be at the top. * Reference is taken from Slideshare. 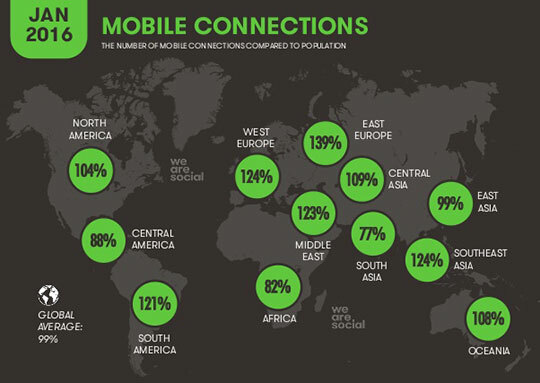 As you can clearly see, the number of mobile connections compared to population has been increasing as more and more people own mobile devices and browse online. Traffic from mobile devices is twice as large as traffic from applications. Traffic desktop has remained flat and is stagnant. It is pertinent to cater mobile visitors to your sites so as to grow any organization. Higher visitor engagement and conversion rates can be achieved through optimized websites and for that one need to execute best practices for acquiring quick and upgraded site pages. Understand how your website performs on mobile devices. Analyze the performance impact of your website. Know how your website responds and compares its speed. Compare your mobile response time and web response time. Studies have shown that when content is optimized for use on mobile devices, it has eventually resulted in higher conversions and lower abandonment rates. So how would you ensure that you are successfully tending to your clients on cell phones? Do you want to know how your site currently performing on mobile devices? 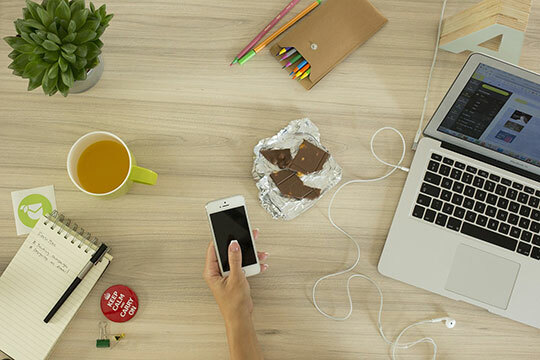 Are your site performs well when viewed on mobile devices? Are all these thoughts recur your mind and for that, you are looking for a tool to measure your site’s performance then mobiReady is your answer. 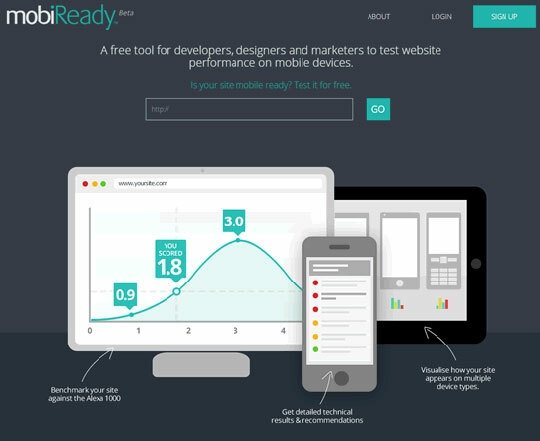 It is a tool for marketers, developers and designers to test their websites’ performance on mobile devices and it is free of cost. You don’t have to pay any fees for subscription or anything like that. By using it, you get detailed analysis and technical results and recommendations and you can see how your site appears on multiple devices. You can instantly visualize a site on a range of devices. What makes it unique is that it enables you quickly to see how your site looks to users. It’s not a hard and fast rule, all you have to do is just enter the URL and visualize how your site looks on different devices from desktops to mobiles. It gives you an idea of how your site looks and how to improve its interface. You can view all your improvements and benchmark your web presence in the competitive market to stay ahead of your competitors. If nothing works, then there is Google. If you are skeptic about which tool to use and can’t rely on anything, then Google comes into play. 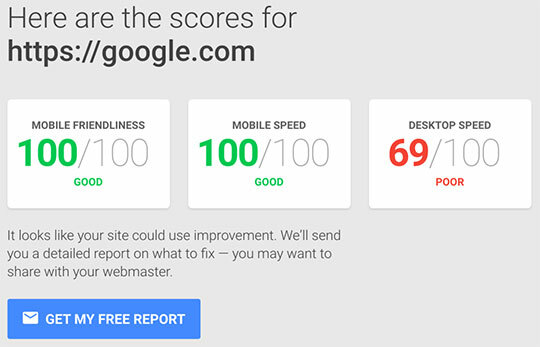 Google has launched a simple tool TestMySite, to test your website’s performance. 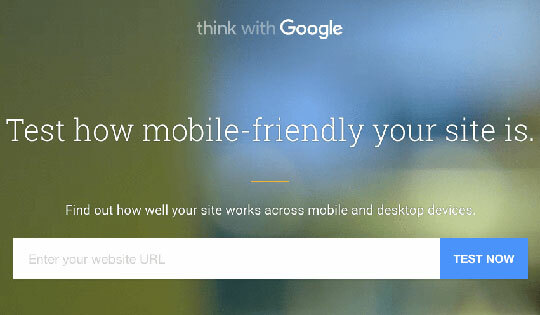 It shows how mobile-friendly your website is and ways to improve it. > Mobile-friendliness: it determines the experience users have while they are browsing your site on the mobile devices. The higher the score is the higher your site is mobile-friendly. Your site should be easy to navigate through and can be smoothly accessed. > Mobile speed: nobody likes to wait, especially when sites make people wait for long. If your site has low mobile speed then you will miss a lot of visitors and your conversions will be low. It determines how long your site takes to load on mobile devices. > Desktop speed: it determines how long your site takes to load on the desktop and if your site is capable of engaging the users through we connections or not? If you want to get in-depth details about your site with recommendations and suggestions, all you have to do is provide your email address to Google and get your free report. 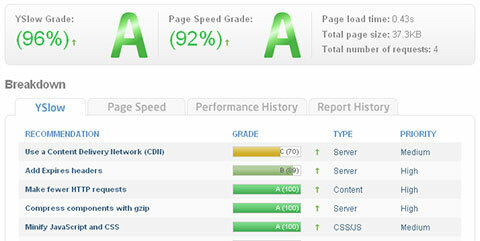 GTmetrix is another tool which to analyze your website performance and provides recommendations to fix the issues. It gives you an insight on how well your site performs across multimedia platforms and how well your site loads with ways to optimize it. What we overlook while analyzing our site’s performance is the region from where we are accessing it as it also depends on the geographic conditions too. In order to outreach global clients, you have to analyze the loading speed of your site from different regions around the world to check how users from that particular area would see it. 12 servers in 7 different areas globally give you a wide geographic reach for analyzing your sites. They give you report and tells you how your site loads and what more can be done to improve it. It lets you test your pages weekly and monthly to be optimized. It has another feature of GTmetrix PRO to get hourly monitoring which requires a subscription and has more and better features. This article is written by Jessica Alba. She is a PR executive at CWS Technology for more than 4 years and has worked on the diverse subject matter. Fueled by a passion, for research, she provides enthusiasm through her work. Follow her on Google+. Thanks for this great, informative and useful article. Site speed always matters for search engine rankings, GTMetrix is an excellent way to analyze your site for page speed and YSlow factors. Along with GTMetrix, you can also try Pingdom. I use GTMetrix. Seems the complete solution. Also, Google Pagespeed is good. I’d also recommend Monitis for checking website performance. It works great for me.